Boycott the coming presidential election and see what Nigeria will become at the very shortest period. The long-awaited Biafra referendum is here, and we need not toy with it at all. The 16th February 2019 is the presidential election in Nigeria, the country with the most massive black race in the world. It is epoch-making for the country that the world leaders and the super-powers will beam their satellite on the nations of Nigeria to know what goes on in Nigeria at this point in time, because it may not really be a fair day for the British creation. Many countries of the world have viewed Nigeria as a tense zone, and many have also marked Nigeria as a country with an eminent breakage or preferably at the brim of war. Many prophets and men of God had spoken out vividly with all clarity that Nigeria is going to break into nations as an agenda of heaven to save destinies and lives of men that were trapped in this British creation called Nigeria. The Fulani oligarchy, who have been in control of power for several decades have continued to marginalize other tribes and regions especially, the Eastern region of Nigeria called Biafra and have refused to relinquish power to other regions. They put together the 1999 constitution of the federal republic of Nigeria to favour themselves, above other regions. The British tampered with the figures of the first census to give the northerners a numerical advantage. This numerical advantage gives them the majority in the number of LGAs, states and by extension the majority in the federal legislature. They have been involved in rigging anything riggable to favour their region only. So taking part in an election or voting is to vote them into power again, which is voting poverty, lack of job, massive killing and kidnapping in our land. In reaction to the inhuman, bad governance and economic emasculating policies and programs of the country, Biafrans must express their feelings. For the unjust killing of Biafrans, most especially the continuous brutal massacres of indigenous people Of Biafra (IPOB), we have to boycott anything “boycottable”, most especially this 16th February 2019, already rigged presidential election. We must shut down Biafraland for the world to know our stand. We have decided to use civil disobedience as a tool in our struggle, self-determination is enshrined United Nations charter. The boycott is just to drive home our resolve to exit this Lugard’s creation that has done us no good. We know the world will be watching, if we will go out to vote, it will show that we are not serious. On the other hand, if we all sit in our houses, they will know that honestly, these people don’t want to be part of this entity anymore and the blood-thirsty vampires in army uniform will not see anybody to kill. Everybody Should Just Sit at home on 16th February 2019. Do not go out to vote for Nigeria election, and that means you have proposed for Biafran Nation. The Only peaceful way to be free as UN, US, EU ECOWAS & Israeli Observers are Coming in to Monitor the Sit at home! If we didn't participate in the Nigeria election, then Biafran Land will regain freedom without War. Many freedom fighters all over the world had used boycott as one great tool: Martin Luther King, Mahatma Gandhi, Nelson Mandela and many others had used it and it worked for them. 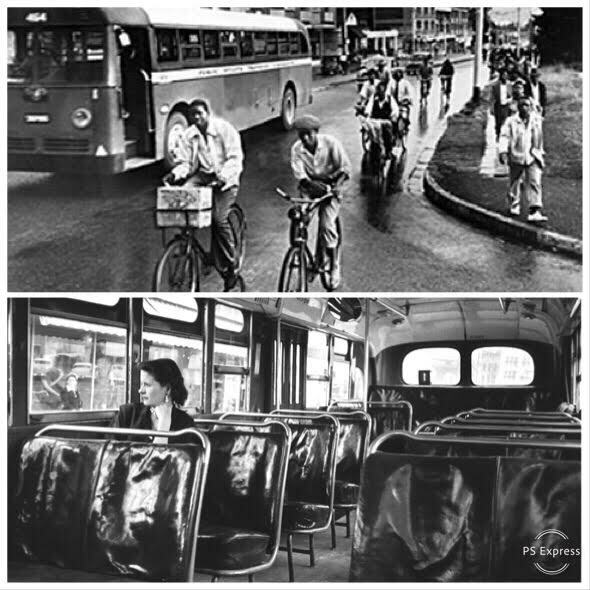 Martin Luther King told his people to boycott the National Transportation System and some Elections too and I can tell you categorically that it worked like fire, so long as it is done perfectly well. Imagine telling his people to boycott the transport system and walk, they obeyed and the government buckled. 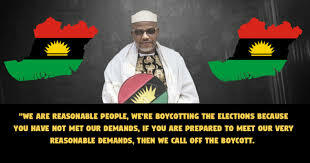 Here Mazi Nnamdi Kanu is just telling our people to boycott an already rigged election, I hope and pray we listen. May God bless us as we sit at home on this memorable day of our lifetime, and may God bless the United States of Biafra. Thank you.